Not sure how I like this image. 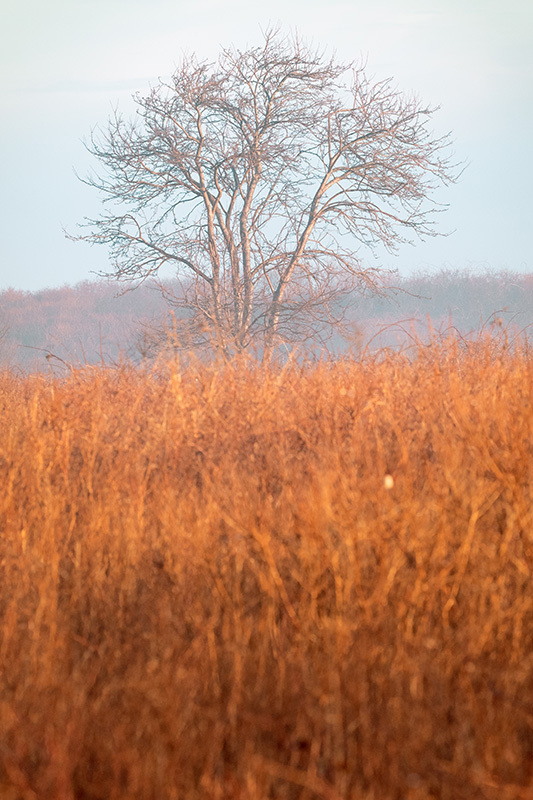 I really enjoyed the scene when I shot it; a slightly foggy field lit golden in the morning sun. Looking at it now, I wish it had something a bit more interesting in it. Perhaps something in the foreground, like a large rock. I have a tighter cropped version, but it feels a bit flat. Hi-a few thoughts. I can see what you liked here- the colors, light and a bit of fog. I think perhaps there is too much out of focus foreground. A crop would improve that. Also your tree is right in the center. Was there something interesting on either side? Composition-wise it usually works better to have the main subject off-center (Rule of thirds). Not always true, but I think it would help here. I like it but wish the DOF extended into the foreground. Maybe go to 5x4 on this one! I like the concept here, but I think the OOF f/g distracts too much.